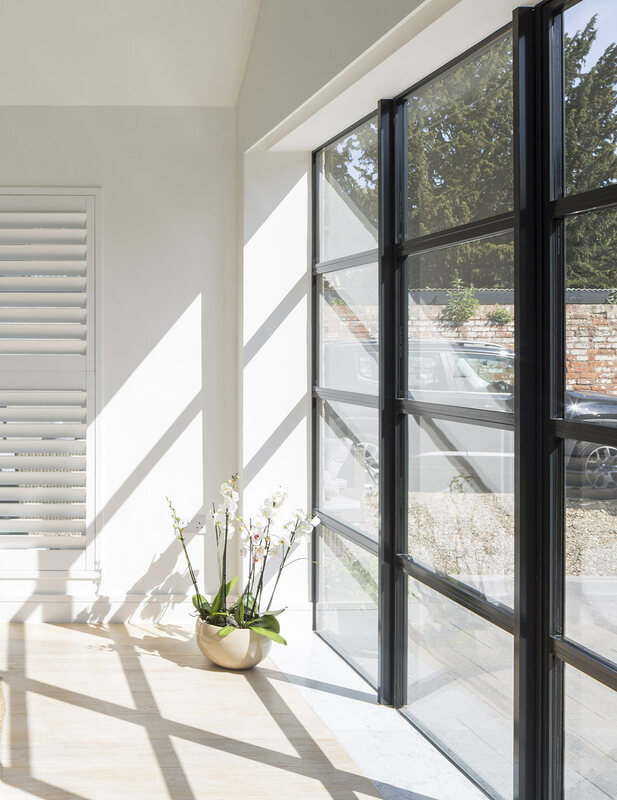 Delighted to share with you a recently completed Loft extension/refurbishment in a 1990s bungalow, North London, D*Haus were asked to completely rethink and open up every part of this dated piece of residential architecture. There was a long wish list in comparison to the budget which is akin to all our clients, no matter how big the job. Interestingly enough, the ratio of wish list to budget always stays the same; the bigger the budget the bigger the wish list. Working as a team we did the best we could, in terms of adding value back to the house. 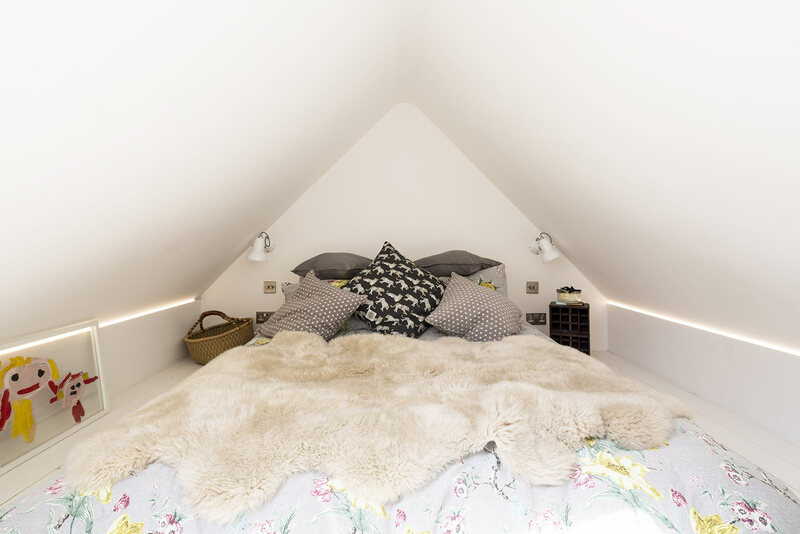 We felt strongly about fitting out the inhabitable loft into a small yet useable guest bedroom. 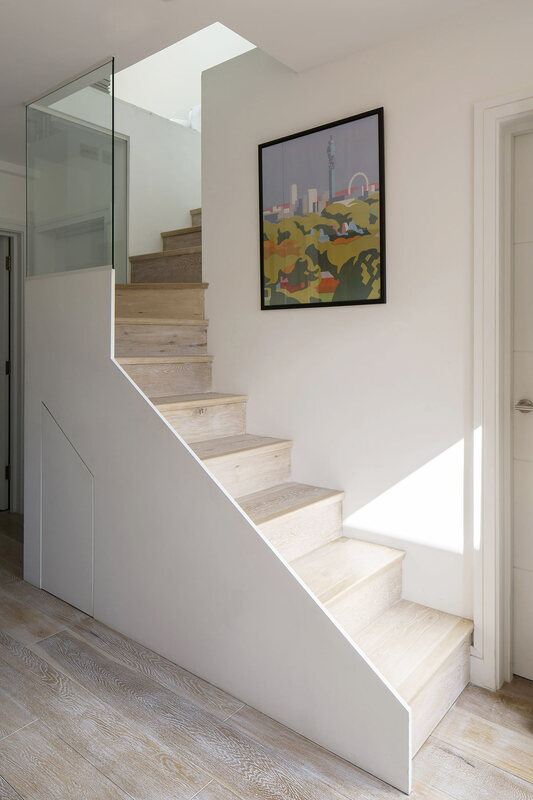 Creating a narrow timber and glass stair that winds up from the entrance hall and goes carefully around the existing sprinkler system and structure. 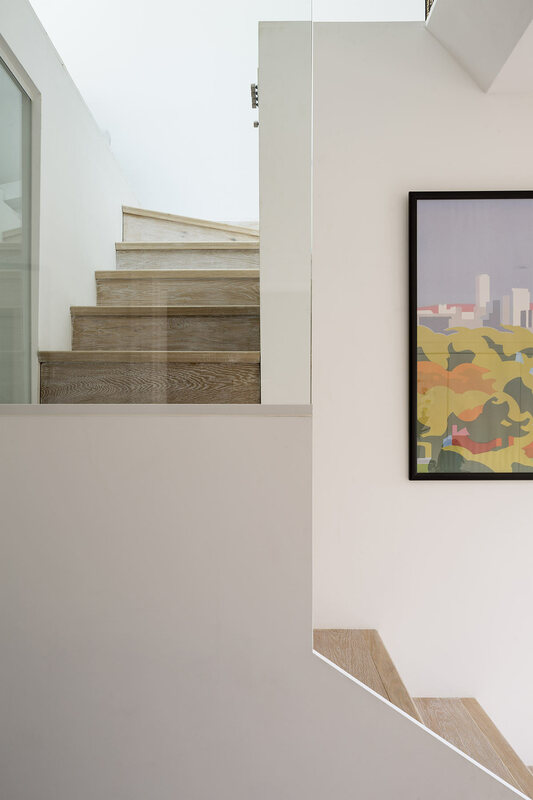 By minimising this new stair intervention we saved on the need for additional steel work or supporting structure. 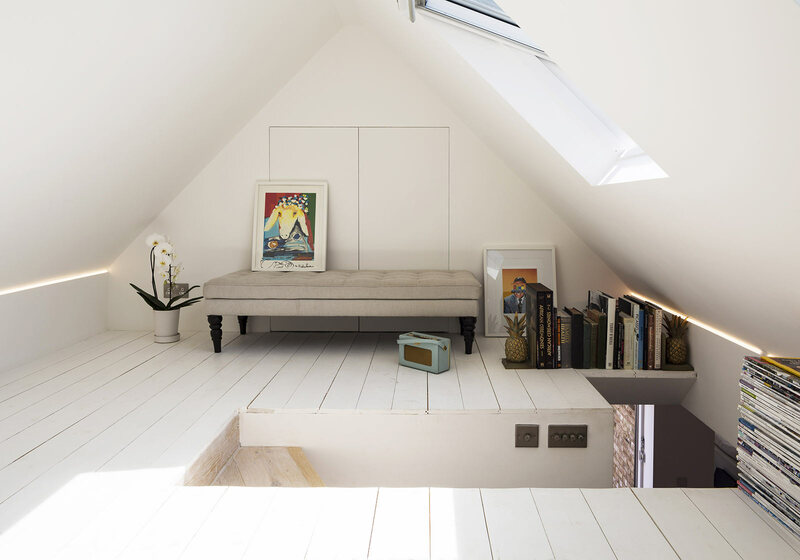 We added two off the peg skylights to give natural light to the loft space whilst keeping cost down. Inbuilt storage and a super low bed make use of the limited head height. Finally, to complement the length of the loft we ran 2 parallel LED lights, that are also very low budget, to draw attention to the linearity of the space. We used low cost timber floor boards that were then painted white to give a better finish than the original budget would allow. 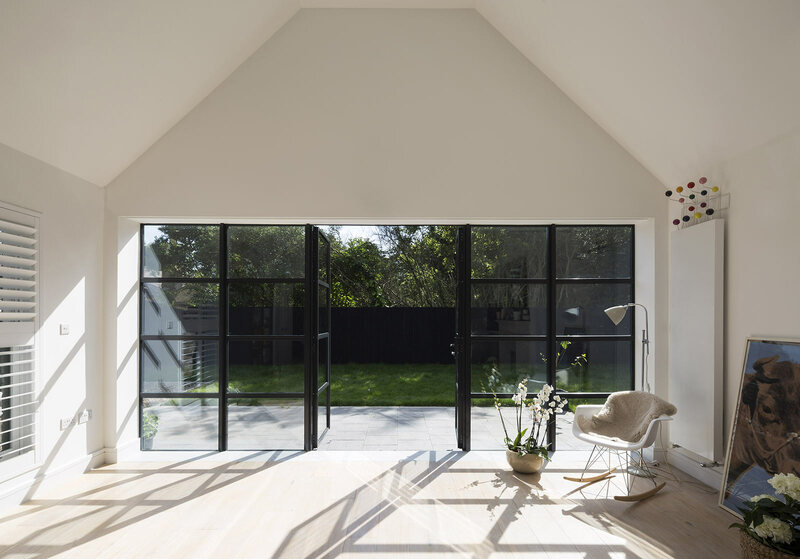 Moving to the main living room, the client made clear that existing building had a broken connection from the internal living space to the large garden that sits around the site. 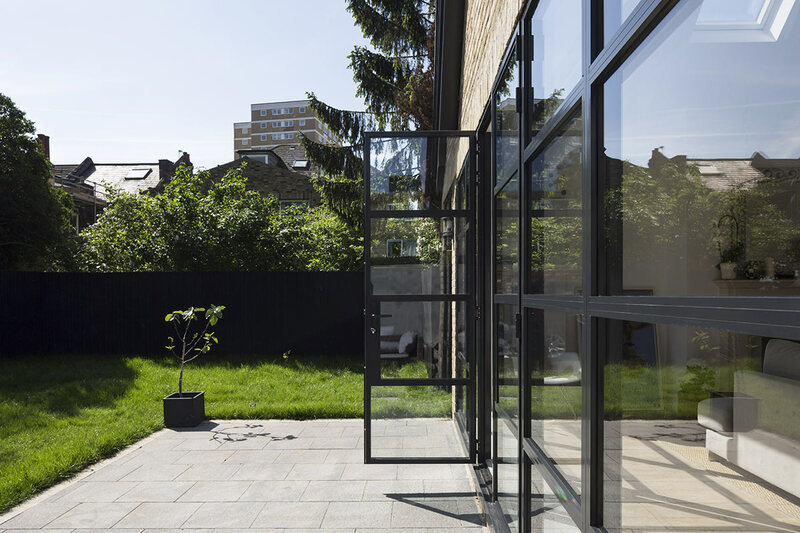 A collaboration of ideas tested using different materials and finishes, and through 3d modelling/CGIs, we came to the final design which used a full width Crittall curtain wall placed along the rear wall. 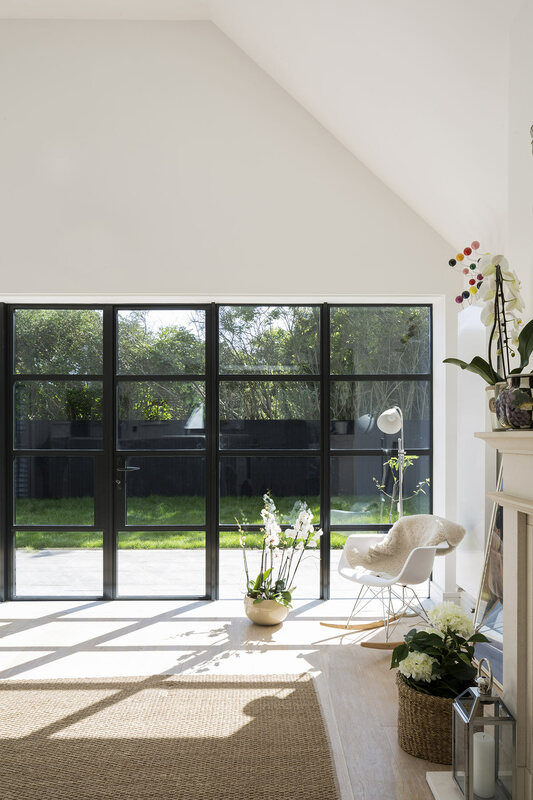 This completely opened up the back wall of the living room allowing views straight out into the garden from the kitchen at the rear of the living room. 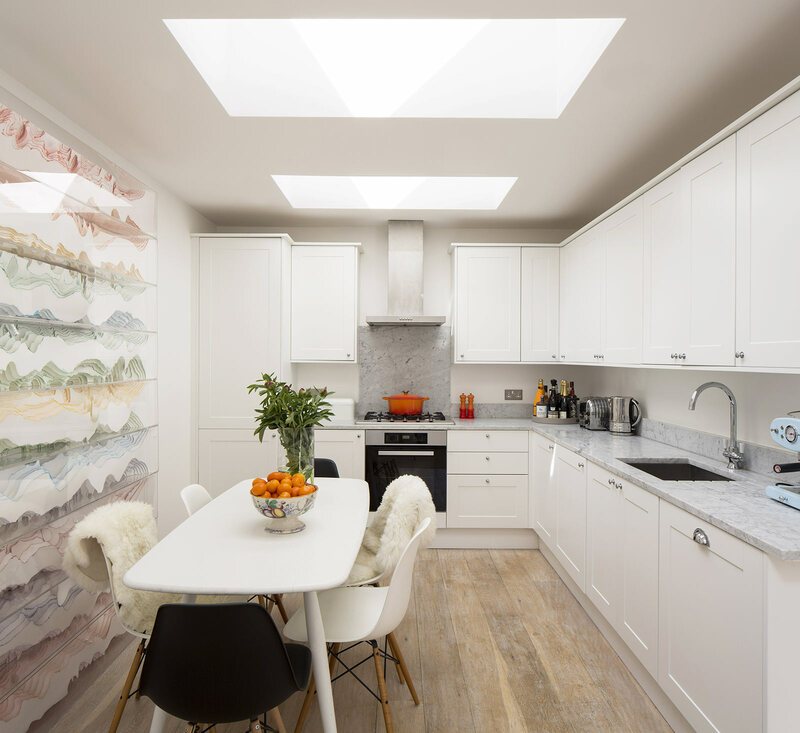 To save costs the kitchen carcases were retained and new doors were created in the style that pleased the client, this way the doors could be painted professionally then brought to site and installed. The new look of the kitchen was complimented with a Marble Worktop to complete the overall refurbishment. The same Marble was inserted between the timber floor and the wall of Crittall glass which gave a very high end look. “We shape our buildings then our buildings shape us.